366 pages | 49 B/W Illus. The landscape of contemporary research is characterized by growing interdisciplinarity, and disciplinary boundaries are blurring faster than ever. Yet while interdisciplinary methods, and methodological innovation in general, are often presented as the ‘holy grail’ of research, there are few examples or discussions of their development and ‘behaviour’ in the field. 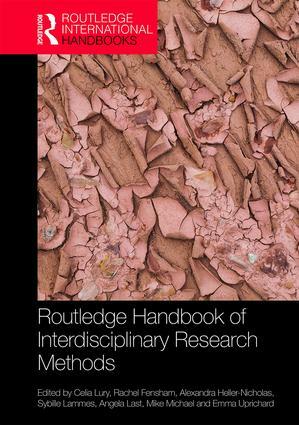 This Routledge Handbook of Interdisciplinary Research presents a bold intervention by showcasing a diversity of stimulating approaches. Over 50 experienced researchers illustrate the challenges, but also the rewards of doing and representing interdisciplinary research through their own methodological developments. Featured projects cover a variety of scales and topics, from small art-science collaborations to the ‘big data’ of mass observations. Each section is dedicated to an aspect of data handling, from collection, classification, validation to communication to research audiences. Most importantly, Interdisciplinary Methods presents a distinctive approach through its focus on knowledge as process, defamiliarising and reworking familiar practices such as experimenting, archiving, observing, prototyping or translating. Celia Lury is Professor and Director of the Centre for Interdisciplinary Methodologies at the University of Warwick. Rachel Fensham is Professor of Dance and Theatre Studies and Assistant Dean of the Digital Studio, Faculty of Arts, University of Melbourne. Alexandra Heller-Nicholas is a writer on contemporary cinema and a Research Associate at the Victorian College of the Arts, University of Melbourne. Sybille Lammes is Professor of New Media and Digital Culture at the University of Leiden. Angela Last is Lecturer in Environmental Humanities at the University of Leicester. Mike Michael is Professor of Sociology in the Department of Sociology, Philosophy and Anthropology at the University of Exeter. Emma Uprichard is Reader at the Centre for Interdisciplinary Methodologies at the University of Warwick.